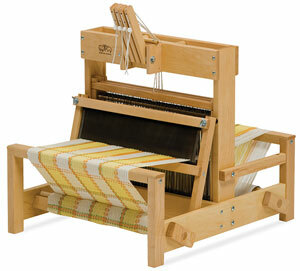 The Schacht 15" table loom is a great weaving-width loom for classroom use, workshops, sampling, and small projects. It's also ideal for learning about four-shaft pattern weaving, since the direct tie-up through the hand levers allows for infinite experimentation. Fine-toothed nylon gears are used on both the warp and cloth beams, which allows for precise tension control. Front-mounted levers make shaft selection easy to reach with either hand, and easy to see at a glance which shafts are raised. Expertly crafted of the finest hard maple for maximum structural stability, this table loom promises to hold up well even after years of heavy use. The loom comes with a stainless steel 10-dent reed, flat steel heddles, two apron rods, and three lease sticks. The Schacht Table Loom is great for both beginners, due to its simplicity and ease of use, as well as for more advanced weavers who want to experiment with a wide variety of designs and patterns. Our video explains the parts of the loom and how to get started weaving.